Students at the class of Prof. Klaus Hesse at the Hochschule für Gestaltung Offenbach from China, Korea, South Africa, Brazil and Europe have tackled pressing contemporary political and social issues in response to Wilhelm Zimmermann's exhibition at the Institut für Stadtgeschichte Frankfurt am Main. Pro and Contra. An in-between does not exist for students at the HfG. 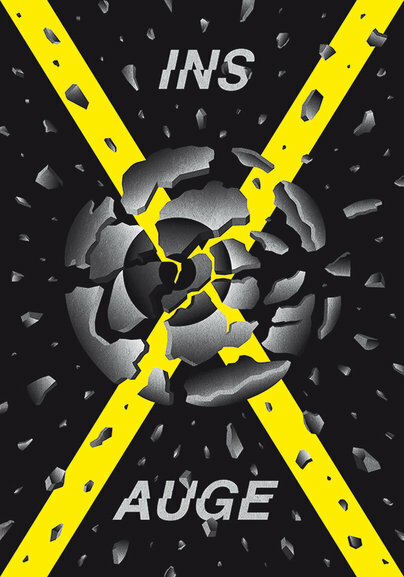 On show are posters that take a stand against concerns such as political pressure, maritime pollution, fine dust alerts in cities, surveillance of the internet, genetically engineered food and violence against refugees or dissidents. Also on show are posters for a free press, for labour laws, for the rights of refugees and the right of everyone to an education. The show presents many attacks on our way of perceiving and thinking. Many of the works on view won international awards. 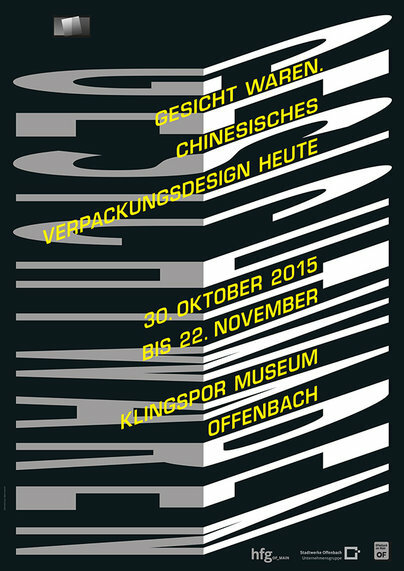 The opening event »Keeping Face – Chinese packaging design today« (» Gesicht Waren – Chinesisches Packungsdesign heute«) in the Klingspor Museum Offenbach was received favourably by an interested public. Guests and speakers included the mayor of the City of Offenbach Horst Schneider, Prof. Gu Chuanxi/Shanghai Institute of Visual Art, Dr. Stephan Soltek/Director of the Klingspor Museums, Prof. Klaus Hesse/Dean of the Institute for Art at HfG Offenbach, Prof. Gerhard Mathias/Kunsthochschule Kassel, Konsul Zang Ming/Chinesische Consulate Frankfurt, Dr. Holger Niedenthal/presidents of Freunde der HfG. On view are the works of both students and of Gu Chuanxi. The exhibition is on show until November 22nd, 2015. Klingspor Museum, Herrnstrasse 80 in 63065 Offenbach, opening hours: Tue, Thu, Fr 10am to 5pm / Wed 2pm to 7pm / Sat, Sun 11am to 4pm. In cooperation with the Institute for Art the Hochschule für Gestaltung the Klingspor Museum presents an exhibition of current trends in contemporary Chinese packaging design. Chinese books as well as packaging have always been more sophisticated and sensual than Western designs in this field. On show are works by students of the »Shanghai Institute of Visual Art« (SIVA) and by Gu Chuanxi, Professor for packaging design and path finder for contemporary Chinese design. »The Shanghai Style« proved to be trend-setting as early as the 1920s, in terms of both Chinese fashion as well as graphic and product design. »Shanghai is different« is still true today. With the foundation of the »Shanghai Institute of Visual Art« ten years ago the metropolis continues to lead in this direction. For many years now SIVA has been one of the international partner universities of HfG Offenbach. Opening hours: Tue, Thu, Fr 10 am to 5 pm / Wed 2pm to 7pm / Sat, Sun 11am to 4pm. 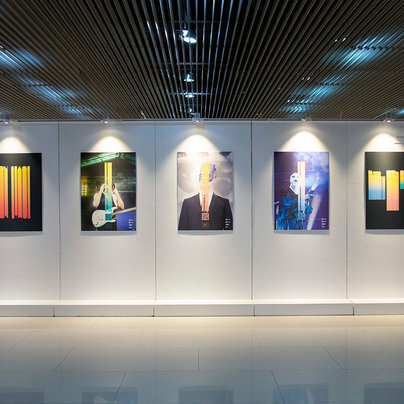 Part of the festivities surrounding the 10th anniversary of the foundation of »Shanghai Institute of Visual Art« (SIVA) is an exhibition of works by students of major partner universities of SIVA. The Intitute of Art at HfG Offenbach is therefore presenting a generous number of works in the exhibition halls of the Institute's library. 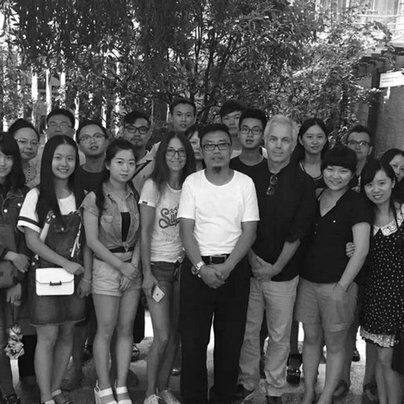 Klaus Hesse, Professor for Conceptual Design and Dean of the Institute for Art led the students in their initiative. Curator is Prof. Gu Chuanxi (SIVA). Exhibiting students: Catrin Altenbrandt, Nikolas Brückmann, Kim Angie Cicuttin, Irini Divaris, Robin Klussmann, Nicole Landwehrs, Yuriy Matveev, Adrian Niessler, Karin Rekowski, Nick Ritter, Katrin Schacke, Tu Shen, Yuan Wang. 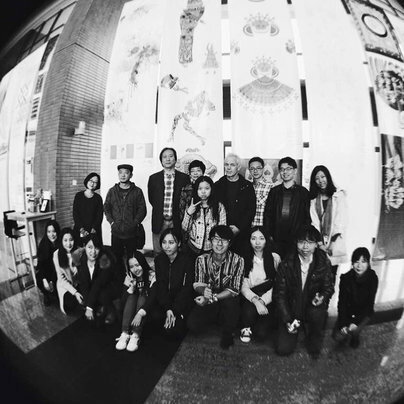 Poster workshop about political poster art with students of Prof. Yang Chao at the Jingdezhen Ceramic Institute. The members of the workshop had work out posters for the currently refugee topic in Europe. 170,000 people fled their homes across the Mediterranean sea last year alone. They all try to escape from war, displacement, poverty and suppression. Many have paid for this attempt to find a better place with their lives. No mercy for people in distress. The violence displayed against refugees and their camps has risen dramatically this year. 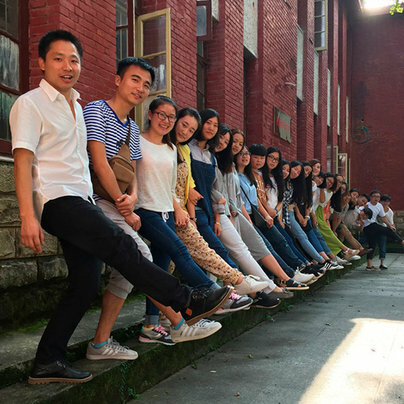 Intensive workshop and research about fashion brand design with the teachers and students of Prof. Zeng Qiang together with Christine Hesse at the Chongqing Jiao Tong UniversityBesides we visited the Academy of Ethnic Cultures of Guizhou Province in Guiyang. The dean has opened his collected treasur of the unique and outstanding Miao and Dong Culture. Presented will be the last issuee of »sushi« as well the results of the class on »Scandals / Information Design«, the short movie »The Cloud«, the animation »The Consumer«, »I love you all« – the magazine project about the downfall of the advertising, a new identity for »Luminale«, »Clumpy – More than one million stories« and the art of the political poster. 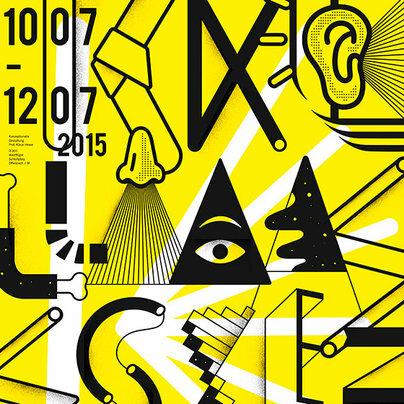 The exhibition has been curated, organised and designed by Yuan Wang and Klaus Hesse. 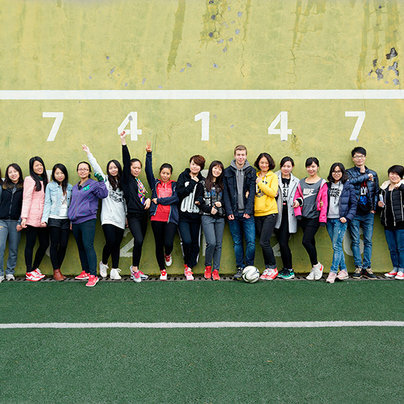 Thank you very much also for Guodong Zhang and all other students which support the exhibition. 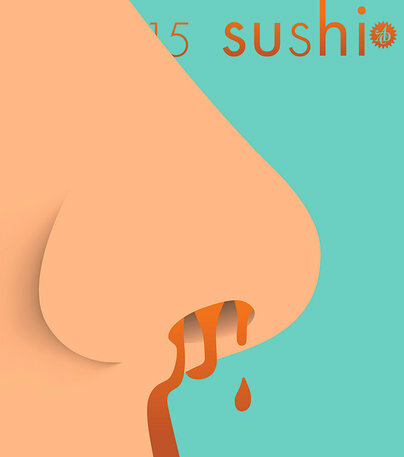 »sushi15« talked with Christoph Niemann about a blank piece of paper. He is working for »The New York Times« and »New Yorker«. He is one of the most sought-after illustrator of the world and has drawn the cover for »sushi1« 15 years ago. 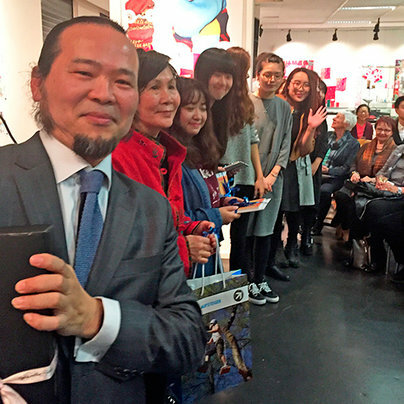 The German-Chinese graphic designer Jianping He told how is feeling between two worlds. The trend researcher Holm Friebe thinks that grass doesn't grow any faster when you pull on it. Besides »sushi« is reporting about the inspiring design conference »What design can do« in Amsterdam and a lot of highly topical stuff more. For 15 years sushi has presented the best works from art and design students from universities in Germany, Austria and Switzerland, chosen by juries from the Art Directors Club für Deutschland (ADC). 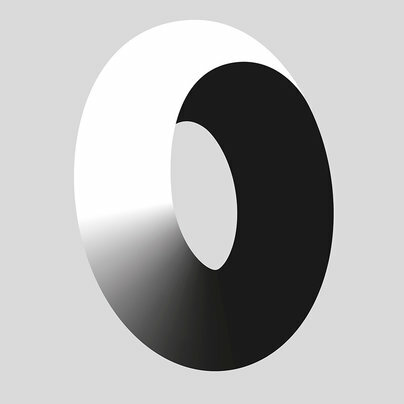 For 15 years students at the Hochschule für Gestaltung (HfG) in Offenbach have created and designed the » Magazine for young creativity«. With this latest issue sushi’s editors now draw conclusions: What has become of the 40 designers who keep creating sushi with such passion? What happened to the winners of ADC awards? Which detours did they take, which paths have they chosen? sushi shows how they learned, suffered and partied, focussing of course on what they created. It’s time for CHINA 2030! 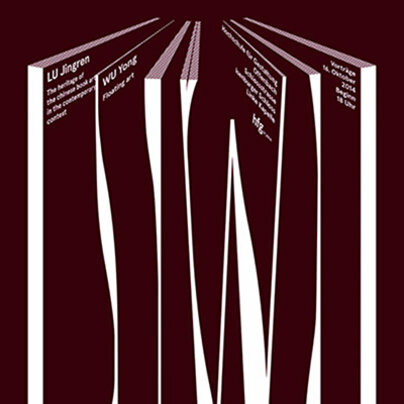 The Poster »LUWU« designed by Xi Lu has been selected for a “Certificate of Typographic Excellence” of the TDC Communication Design Competition. It will be included in the Annual of the Type Directors Club, Typography 36, and will also be shown at the 61st Awards Exhibition (TDC61) in New York City. 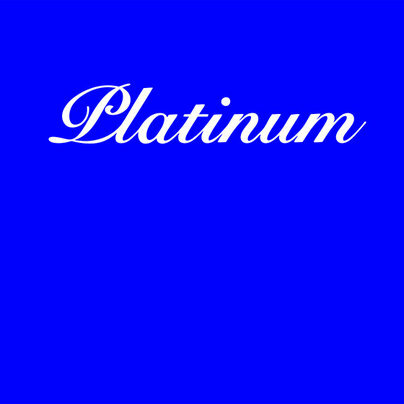 This year 272 winners were selected from over 1600 entries from 49 countries. Besides being exhibited in New York City, the winners will also be included in 7 exhibitions that will tour cities in the United States, Canada, China, England, France, Germany, Japan, Poland, Russia, South Korea, Spain, Taiwan, Thailand, and Vietnam. The project is supported by Prof. Delai Men of the School of Design/SCUT. It was the third workshop for the magazine project »Outlandish«. Each edition features generally unfamiliar regions and cultures. This magazine collects, documents and analyses the visual key codes of identity in remote worlds and unknown lifestyles. 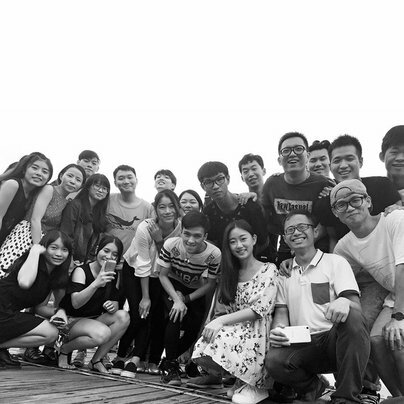 Following students of different mayors like Landscape Design, Fashion Design, Product Design and Electronic Media participated and exhibit: Tian Jiahui, Chen Zhao, Zeng Shuting, Gong Yingying, Hu Xuebing, Kong Yinying, Lin Lin, Liu Qianyu, Shen Jing and Wang Dong. Klaus Hesse had supported and interpreted by Zeng Shuting.